We have certain big families in our Industry. Many actors came out of that families in the past and are coming now. One of the biggest is Mega family which has so many actors, who made their debut into silver screen. It has 5-8 heroes acting at present. One of them is Sai Dharam Tej, whose first film was Rey but debuted through superhit movie Pilla Nuvvu Leni Jeevitham. He is teaming up with Dil Raju of SVC banner for the third time after their successful films like Pilla Nuvvu Leni Jeevitham and Subrahmanyam for Sale. Anil Ravipudi of superhit Patas fame is directing it. Let’s see how it works on us! Jagruthi is the name of a trust which strives for the welfare of more than 15000 people run by Sai Kumar. Vikram Sarkar (Kabir Duhan Singh) eyes on that and occupies it by creating fake documents. Court gives a period of one month to trustees to show documents. Both the team from trust and Vikram Sarkar goes in search of land donors for the trust. Balu (Sai Dharam Tej) is a taxi driver who takes care of his drunkard father (Rajendra Prasad). He joins Rajan, an Anglo-Indian guy into their family. Rajan help in Balu’s father becoming a normal person leaving his drinking habit. One day Beeku gang (Ravi Kishan) kidnaps Rajan for Vikram Sarkar. Who is Rajan?? How Balu saved Rajan?? forms the rest of story. Sai Dharam Tej as Balu is terrific. He has grown as an actor compared to his previous movies. He has all the qualities and capabilities to be a star. He has done a superb job in comic scenes and in emotional scenes. Rashi Khanna as Bellam Sreedevi, SI, is good. She has good comic timing. Rajendra Prasad is superb as a drunkard father. Ravi Kishan of Racegurram fame is nice as Beeku. Child actor Mikhail Gandhi is fantastic. Kabir Duhan Singh as Vikram Sarkar is good. Vennela Kishore, Raghu Babu, Surekha Vani, Thanikella Bharani, Jayaprakash Reddy, Raghu, Srinivasa Reddy, Posani Krishna Murali, Prabhas Sreenu, Prudhvi Raj and other actors performed according to what they are given. Story of the movie is simple and good but routine. Screenplay is good. Dialogues are good and humorous. Tunes rendered by music director Sai Karthik are nice. Bellam Sreedevi had already become a chartbuster. Andham Hindolam remix is also nice. Background music is also good. Cinematography by Sai Sreeram is superb. Visuals are nice. Editing is okay and could have been better. Stunts are well choreographed. Production values are rich. Kabir Duhan Singh is introduced as a protagonist Vikram Sarkar is introduced at first. It is not so powerful or interesting. Pace of the movie shifts gear with the introduction of Sai Dharam Tej. Director has created much funny and humorous scenes which helps the story as well as generate comedy. Bellam sreedevi song which comes in the first half has good moves and well shot. Child artist who did as Rajan’s scenes with Sai Dharam Tej and Rajendra Prasad are nice which are high on emotion. First half ends interestingly with the kidnap of Rajan. Second half begins with flashback of Rajan and runs with some action and tom and jerry type comedy for first 30 minutes. With entertaing and racy first half second half seems to be little disappointing. It has more action blocks. 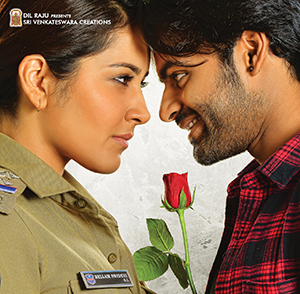 Director Anil Ravipudi who did a superb job with his debut movie has done a good job with this movie. He should have taken much care of second half. Second half is a bit low on entertainment. To sum up, Supreme is an entertaining ride!! !